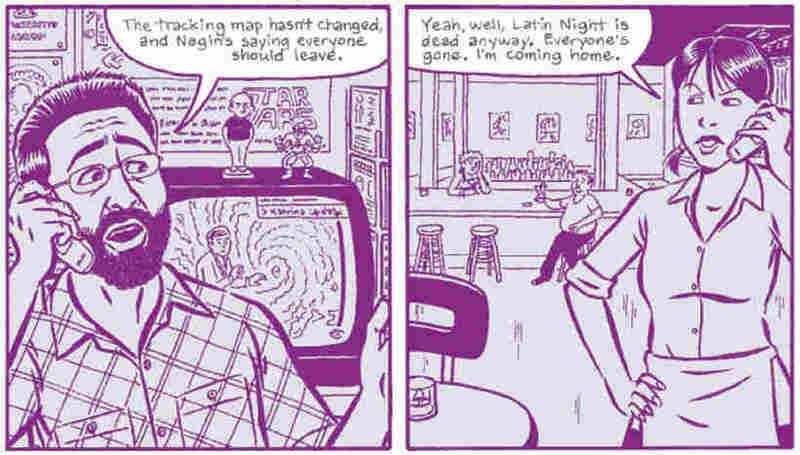 Hurricane Katrina: An Illustrated Story Of Survival In a new long-form graphic novel, the seven main characters might not be super heroes, but they are heroes in their own right. "A.D. New Orleans After the Deluge," tells the true stories of seven New Orleans residents who survived Hurricane Katrina and how they recovered in the aftermath. Writer and illustrator Josh Neufeld discusses his latest work. Neufeld is joined by Leo McGovern, whose story is among those featured in the novel. In a new long-form graphic novel, the seven main characters might not be super heroes, but they are heroes in their own right. "A.D. New Orleans After the Deluge," tells the true stories of seven New Orleans residents who survived Hurricane Katrina and how they recovered in the aftermath. Writer and illustrator Josh Neufeld discusses his latest work. Neufeld is joined by Leo McGovern, whose story is among those featured in the novel. In the four years since Hurricane Katrina devastated New Orleans, we've heard the stories of survivors, seen television coverage of the flooding and read reports about the wreckage. But here's a different take: artist and storyteller Josh Neufeld's new graphic novel "A.D.: New Orleans After the Deluge." It's not really a novel. The stories are basically true, and the characters are seven New Orleans residents who tell their story before, during and after the storm. We're talking to the author and artist Josh Neufeld and to Leo McGovern, who's the model for one of the characters in the book, a person called Leo. Welcome to the program, both of you. Mr. JOSH NEUFELD (Artist and Writer, "A.D.: New Orleans After the Deluge"): Thank you. Mr. LEO MCGOVERN (Katrina survivor): Hello. WERTHEIMER: Josh, why'd you decide to tell the story in this form? Mr. NEUFELD: Well, I've had a fairly long career as a cartoonist, and I specialized pretty much the whole time in doing non-fiction comics. I'm an illustrator for Harvey Pekar, which a lot of listeners may know "American Splendor," who does a long-running autobiographical comic. And I had a very strong relationship to Katrina and what happened in New Orleans. WERTHEIMER: You also had - you had your very own Katrina adventures, didn't you? Mr. NEUFELD: Well, yeah. I did volunteer with the Red Cross and was trained as a disaster response worker and worked for almost a month down in the Gulf Coast after the hurricane. WERTHEIMER: Leo, let me ask you: What's it like to find yourself in a sort of very large, hardcover comic book? Mr. MCGOVERN: It's a dream come true. One of the things that you find out about me in the book is that I'm a life-long comics fan. One of the other things you find about in the book is that I was only able to retrieve one comic from my apartment. But to some extent, anybody who grows up reading comics kind of fantasizes about being a character in a comic in one shape or form. So in that way, it's a great thrill to me. As a New Orleanean, I feel good about telling my - or allowing my story to be told to many, many people around the country who may or may not know exactly what happened in New Orleans and what is still going on now. WERTHEIMER: Well, how were you recruited? How did it come about that your story gets in? Mr. MCGOVERN: After the hurricane, I was blogging about my experiences because I was able to come back into the city. And a Web site called Boing Boing picked up on my story, and then a comic book Web site picked up on the story, which led me to Josh. And so when Josh and Larry Smith from SMITH Mag started the process for "A.D.," I guess my name came up. WERTHEIMER: Josh, you capture the stories of seven different people, and it's a very diverse group. There's a person who looks like he might be a very well-off doctor who lives in the French Quarter who rode out the hurricane and didn't have any particular damage, but dramatic things happened to him anyway as he tried to take care of people. All of the stories are dramatic, but one of the most upsetting, it seems to me, is the story of Denise and her family. They were stranded. She tried to ride out the storm at home, then she evacuated to a hospital, and then she and her family were taken to the Convention Center. We all watched that hideous, horrible ordeal. Tell us about her and why you picked her. Mr. NEUFELD: Yeah, one of those things when I was casting about to find the characters that would, you know, form these stories in "A.D." was that I -there were a couple of story lines that had come out of the whole hurricane that would really resonate with me and I figured would be, you know, for the audience for the book. And one of those was somebody who had been at the Convention Center or at the Superdome, because the stories that came out of it - especially in the first few days after the hurricane - were so horrifying and ultimately, fortunately they were mostly proven to be untrue - you know, stories of roving gangs and rapes and murders and all sorts of crazy behavior by the people there. Mr. NEUFELD: That was, and when I heard Denise actually on a radio program very shortly after the hurricane sort of telling her side and refuting a lot of those wild claims and, you know, actually, it turned out that while she was at the Convention Center, some gang members who were there actually called a truce with each other and worked as hard as they could to restore some order there and realizing that the authorities weren't doing anything, they organized looting expeditions. I would say that's, you know, the best term for it, to get water and food and medical supplies and clothing for people who were just abandoned to their fate there. WERTHEIMER: Very brave and very bitter. NEUFELD: Yeah, well, she, you know, she keeps telling me: Josh, you have to remember, the person who know now is a very different person than the person before Katrina. And I'm much more bitter now. I was much happier and more trusting person before. So I think it's important to, you know, point that out. And I think the title, "A.D.," is doubly resonant because, you know, there's before Katrina and after Katrina, and nothing will ever be the same. WERTHEIMER: If you're just joining us, I'm Linda Wertheimer, and this is TELL ME MORE from NPR News. I'm talking to Josh Neufeld, author and artist of a new graphic book, "A.D.: New Orleans After the Deluge," and Leo McGovern, a New Orleans resident whose story is in this book. Leo, what happened to you when you returned and went to your apartment and you saw what was left and understood what was lost, there was a lot of anger, and I wonder if you could read to us - I've never asked anybody to read from a bubble before, but - page 183. That's where you sort of express that anger. Mr. MCGOVERN: Sure. This is shortly after the hurricane, and my then-fiancee, now-wife, and I are staying at my parents' house about 10 minutes outside of New Orleans, and we're talking about people who had decided to not necessarily return to New Orleans at that time. (Reading) It was around then that the defections really started to annoy me. I couldn't believe how many people were calling it quits on New Orleans. For me, it was never a question that I'd move back somehow. For better or worse, I'm married to this place. I guess folks like Nick(ph), Harold(ph) and Alicia(ph) don't feel that way. They've already washed their hands of New Orleans. Michelle(ph) says: well, you know, it's easier for people who grew up in other places to stay away. I say: I guess, but there's no way I could ever look at those people the same way if they come back after everything is rebuilt and working again. Running away is taking the easy way out. Take part in the process, or stay away. That's just how I feel. WERTHEIMER: Do you still feel that way? Mr. MCGOVERN: That's a good question. I think my attitude toward that has been somewhat tempered in the years following the hurricane. And part of the reason that has been tempered is that some of those people have returned, and one of the things that I've learned about their experiences was that they had their own reasons for leaving and their own reasons for not being able to come back. And my attitude at the time was that I was coming back no matter what. And at the time, anyone who didn't was, I guess, against us, against the city. WERTHEIMER: Josh, in the structure of this book, we see pictures of New Orleans as it was, and then we see the storm come to New Orleans and Biloxi, and then you begin to tell the story from the points of view of all of your characters. And then you go back after the storm and check in with wherever they are, and then at a later point, you go back again. It seems that the people in the book gradually seem to recover their balance, but I think your book really brings home to me how very pervasive the sense of loss was and still is in New Orleans. Mr. NEUFELD: Well, thank you very much because that was actually sort of my overriding story note for the entire book was just to sort of have it deal with what loss meant on a personal level and on a community level and a citywide level, even on a national level, you know, when you think about New Orleans as a cultural treasure. WERTHEIMER: All his comic books. Got some of them back, though, right? I mean, people sent you some? Mr. NEUFELD: Yeah, these wonderful Samaritans from all over - good Samaritans from all over the States, and maybe Canada, too, I'm not sure, started sending him comic books to replace his collection. WERTHEIMER: Now, we haven't even mentioned most of the characters in the book, who all have their stories to tell. But Denise, at one point, is trying to help her mother get settled in a house that was built, very nice people at Habitat for Humanity built for them in Baton Rouge, and her mother doesn't want furniture. Mr. NEUFELD: Mm-hmm. Yeah, that was a really powerful moment for me, when we first went down to New Orleans and interviewed Denise when she was living in that actual home in Baton Rouge. And amongst all the other things she said, which were so powerful, she just said that her mother didn't want to buy a new couch, even if it was free, because she didn't want to have anything more to lose again. WERTHEIMER: But the not-so-nice Denise of today, she's made a comeback, hasn't she? Mr. NEUFELD: She has. Actually, it's a really wonderful story. I think she, you know, had some really tough years after, you know, the first couple of years after the hurricane. But now, she's definitely back on her feet, and she's a Ford Foundation fellow and is working as a social worker and helping entrepreneurs, small entrepreneurs in the city, I guess micro-businesses. So I think she really gets a lot of help for herself by helping others. WERTHEIMER: You didn't tell stories that had just massively tragic and horrible, unhappy endings in this story, and we know there were plenty. I mean, there were the people who died in the attics, the people who were floating in the flood, the dead bodies at the convention center and at the dome. Why not tell their stories, too? Mr. NEUFELD: I think there's a couple of reasons. One is just in my mode of storytelling in comics, I try very much to tell very human and down-to-earth stories that I think people can relate to. And I remember I read Dan Baum's wonderful book, "Nine Lives," which came out earlier this year. It's a similar book in the sense that it tells nine different people's stories who all survived through Katrina. And one of the things he said when he was choosing his characters from the very beginning is that he said they would be all true and that they would all have happy endings. And I guess that's kind of the way I wanted to leave this book, too, is these are all real people who are still living today and are, you know, have ambitions and goals looking forward in life. They're moving forward. WERTHEIMER: Josh Neufeld is the author of the new graphic novel, "A.D.: New Orleans After the Deluge." It's available at bookstores now. He joined us from our New York bureau. And Leo McGovern is a New Orleans resident and agreed to become a character in this book. Leo joined us from New Orleans, and thanks to both of you. Mr. NEUFELD: Thank you very much. I really enjoyed it.